We have plenty of can’t-miss events in October, including our H2H’s on increasing energy and women’s health. July in Ohio is always a great month - warm nights, catching a baseball game, having friends over to grill, we could go on! This month at our practice, we have a few events, including leading up to Dr. Bob’s fortieth year in practice anniversary in the beginning of August. Here’s what’s coming up! This year has been incredible so far helping current and new practice members achieve their health goals. We have some important updates for you this month (please see below), and a “H2H” you won’t want to miss! We're (hopefully) in winter's final stretch, but who knows what Cleveland has up their sleeve, right? Regardless, we have a great month planned, including our Half-Hour to Health on March 7th at noon and March 8th at 6p, both at our Westlake practice. This month will be focusing on a drugless approach to anxiety and depression. Did you know over 40 million Americans have symptoms of these two conditions? Our core focus in chiropractic is to help your brain work properly with the body. We also provide additional support with personalized nutrition, which we will go into more detail at our March H2H. Li-Zyme Forte – This is a vegetable-based lithium product. It is especially helpful in balancing out our neurochemistry and can have a relaxing effect on the body especially in times of severe stress and anxiety. 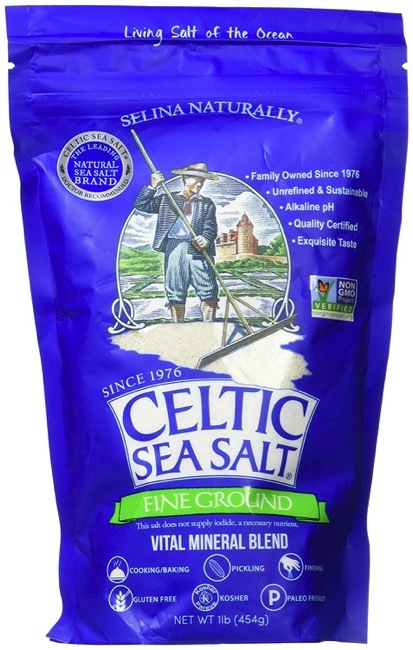 Celtic Sea Salt – ALL Products on specials – Celtic Sea Salt is a beneficial blend of mineral salt that helps provide the body with the nutrients that it would not get on its own. Most people misunderstand salt and think it is not healthy. However, Celtic Sea Salt is the opposite; our body needs salt and what better way to get it than its most natural form. Have you ever considered getting a hair analysis? This test provides a mineral blueprint of your biochemistry, metabolic rate, energy levels, sugar and carbohydrate tolerance, stage of stress, immune system and glandular activity. If you are interested in having this test done, please touch base with the team or doctors at your next office visit. March 7 - H2H @ Westlake Office. 12 pm. Topic: A Drugless Approach To Anxiety and Depression! March 8 - H2H @ Westlake Office. 6 pm. Topic: A Drugless Approach To Anxiety and Depression! March 13 - Dr. Bob @ French Creek YMCA Community Room. 1-2pm. Topic: How to Detox Naturally. Lastly, do you have a business or organization that could benefit from hearing a personalized talk about health? Having subpar health in an organization is one of the leading causes of lack of production and happiness as a group. \If you are interested in having our team do a presentation on a variety of topics including: stress, energy, eating well on a budget and many more, please contact drcasen@druglessdrs.com! This month, our H2H was on the steps you can take to prevent cancer. Many of us have had someone who has been, or even ourselves, affected by some cancer, but did you know that there are preventable steps that you can take? Here is our outline from the talk - please listen to the audio recording below, and share with the people in your world who you know can benefit! - A hundred years ago, one in 80 Americans were diagnosed with cancer. Currently, WHO (World Health Organization) estimates 1 in 2 men, and 1 in 3 women will get diagnosed with cancer. - Journal of Nature January 2016- 90% of all cancer related to environment and lifestyle choices. - The average cost of any cancer treatment in the traditional model is 50k per episode. Food – Minimize carbs, sugar, and dairy – these sugars can cause the body to be a breeding ground for cancer. Eat Organic & Non-GMO – Herbicides and pesticides compromise how your body heals. Stay Thin – Being overweight is a significant risk factor in leading towards developing cancer/estrogen. Minimize Toxic Exposure – This can be from an occupation or through chemicals utilized in the home. Healthy Liver Function – Detox, castor oil pack, Livotrit, milk thistle, minimize alcohol and sugar consumption. You want to have a daily bowel movement—not every other day or so. Happy Immune System – Having a healthy immune system will help to fight cancer. No sugar. Apply one to two drops of liquid Iodine to the breasts daily. Men take 12 mg of iodine daily. A. The urine iodine loading test is an excellent tool as is a Thyroid Profile. Optimal Spinal function correlates to Optimal Nervous System function; be the healthiest on earth! The best way to beat cancer is by being healthy and staying healthy! A great way to have a cancer check is breast thermography. 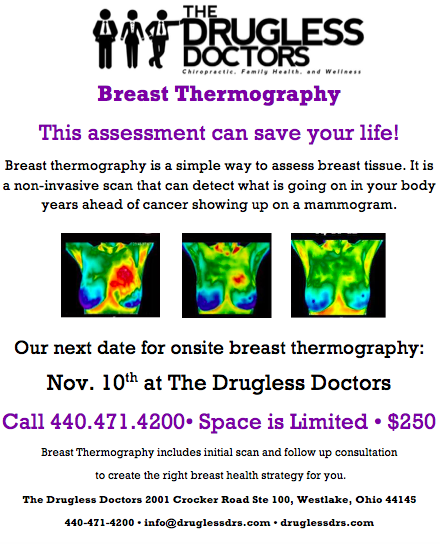 Next Breast Thermography Session: May 1st or May 4th - info@druglessdrs to schedule. February 2 - Breast Thermography Day at Westlake Office. Click to learn more. February 7 - H2H @ Westlake Office. 12pm. Topic: How You Can Prevent Cancer! February 8 - H2H @ Westlake Office. 6pm. Topic: How You Can Prevent Cancer! Check out our NEW appointment management app called SKED. If you have not downloaded this yet, you can go to the App Store and search SKED. This program is great for smartphone users. Key features include: having your The Drugless Doctors card on your phone, the ability to change adjustment times, receiving a text reminder for your appointments, and communicating with our team via the message format. Ask our team for assistance in getting your information set up in your phone. The Acoustic CardioGraph is a beneficial assessment to nutritionally evaluate what is going on in your body. This will be on special all month for our current active members for 35 dollars (regularly $65). In recognition of American Heart Month and the importance of oils for your heart, all of our omega-3 oils will be on special! Make sure to take advantage this month with 10% off on all flax products, Bio-Omega-3, and Optimal EFA. It was a great week spending time in our community. 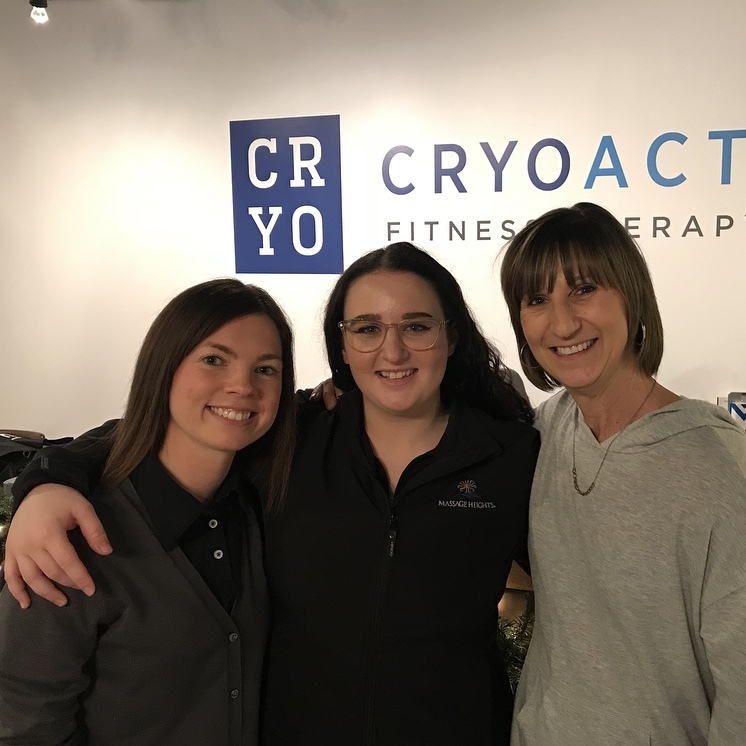 We were able to connect with our friends at the YMCA French Creek about keeping your 2018 health goals, and then spent time at CryoActive Rocky River for their "New Year-New You" event, shot some new videos, and then wrapped it up at Heinen's in Rocky River for their Wellness Fair. We would love to connect with you too - email drcasen@druglessdr.s.com and we can arrange a health talk for your organization. We hope that 2018 is going to be your healthiest year yet, and we are truly thankful you have chosen us as your healthcare provider. We’re starting off January focusing on how you can lose weight and safely detox, sounds good to us! Please note our January 1st and 2nd schedule times, and our other events, including our first Breast Thermography date of 2018 at the end of the month. Jan 3 - H2H @ Westlake 12p. Topic: A Drugless Approach to Weight Loss and Detox! Jan 4 - H2H @ Westlake 6p. Topic: A Drugless Approach to Weight Loss and Detox! Jan 9 - Dr. Casen @ Curves, Fairview Park. 9:30-11;30a. Functional Wellness Assessments. Jan 9 - Dr. Casen @ CryoActive Fitness Therapy Rocky River. 5-7p. Topic: New Year, New You Event. Jan 9 - Dr. Casen @ French Creek YMCA Community Room. 1-2p. Topic: How to Keep Your New Years Goals. Jan 12 - Avon Lake Health Fair, Avon Lake High School 11a-12p. Like we said above, we’re “All In” to help you reach your weight loss goals in 2018. We’re celebrating your success by taking 10% off our detoxification program. To receive the discount, you must purchase at our Westlake or Elyria practice. Beginning in 2018, Dr. Casen will be performing the breast thermography regularly in our Westlake Office. The next breast thermography date is Tuesday, Jan 30th in the morning, and all day Friday, February 2nd. Call our office now at (440) 471-4200 to schedule, since space is limited. For those who have never experienced this before, it is a fantastic assessment to help your body be at peak potential. Please go here to view our PDF on Breast Thermography. Dr. Bob is setting up shop this winter in Naples, Florida, and has his in-office dates set up until April. Please go here to view his calendar and email florida@druglessdrs.com to schedule your appointment. See you in the sunshine! It’s the most wonderful time of the year! 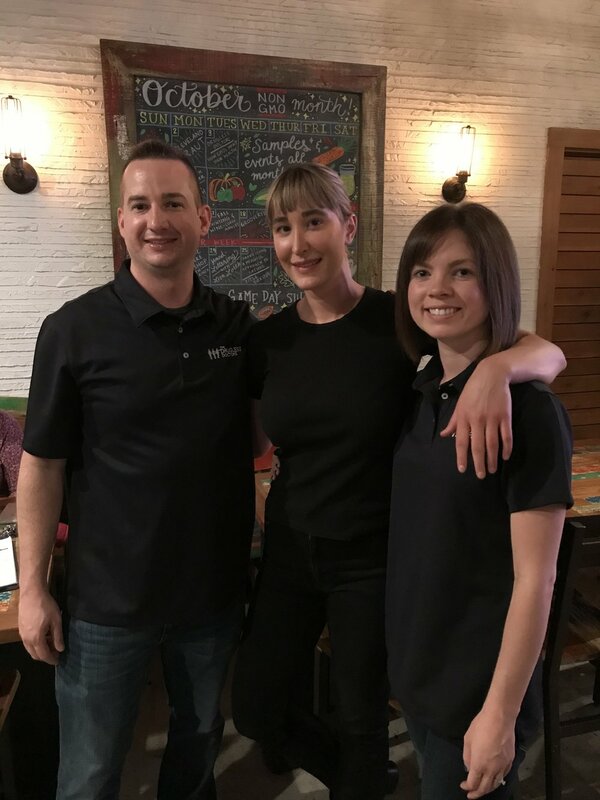 This year has been incredible at The Drugless Doctors; we’ve been able to meet many new people through our “Lunch & Learns” at various businesses and schools, participating in local events like The Westside Flea, and even by the conversations that arise when people see our logo on our shirts. Needless to say, we’re thankful you have partnered with us when it comes to providing you with the best healthcare around. Speaking of health, we have a few Christmas specials that would make perfect holiday presents, including Dr. Bob’s new book, plus a look at additional happenings. From all of us at The Drugless Doctors, Merry Christmas! Dec. 6- Half Hour to Health 12pm @ Westlake Office. TOPIC: A Strong Immune System! Dec. 7- Half Hour to Health 6pm @ Westlake Office. TOPIC: A Strong Immune System! Purchase a gift card for a friend or family member to come into our office. The gift card is for their first appointment, consultation, exam, films, and a follow up to go over their health plan. It will be $40 to help celebrate our 40th year. This is to be a gift – call our team 440-471-4200, or in-person to buy your gift cards. (Does not apply to Medicare, Medicaid, Caresource, Workers Comp, or Personal Injury cases or where prohibited by federal law). Dr. Bob’s tenth book was just released! To celebrate, we’re offering a special December discount of 50% off. Other Dr. Bob’s books are on sale as well (3 books for $45). 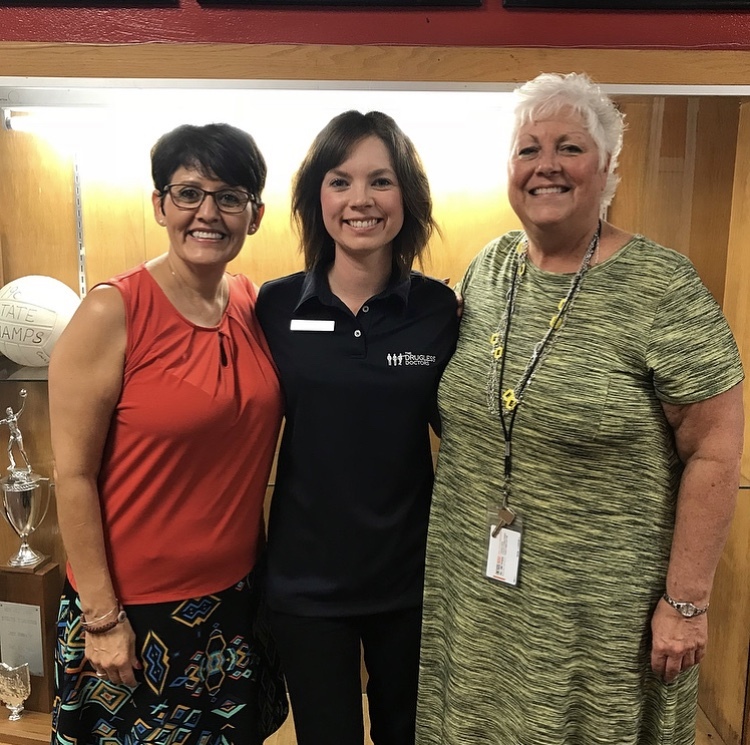 This week had us connecting with our friends in self-care, non-profits, and local government, and we loved it! Thank you to our friends at CC Salon & Spa, Elyria City Hall, Westlake High School, and the Greater Cleveland Food Bank. Speaking of, this holiday season we will be partnering with the GCFB - bring in your non-perishable food items when you come in to see us! Lastly, please join us this Wednesday at noon, or Thursday at 6p for our November "Half-Hour to Health" as we will be sharing our favorite simple recipes. Have a great week! Dr. C at cc salon and spa. Email drcasen@druglessdrs.com for health fairs and events! We’re in the final stretch of 2017, and if you have started care this year with us, we hope this has been your healthiest year yet! This month sees the return of our breast thermography service (more information below), alongside some other events, like our Food Drive. Please join us next week for our H2H on Simple Recipes. Bring some friends as we share how making healthy and nutritious food can be easy and fun! Nov. 9 - Faster Results Workshop 6p @ Westlake Office: Helping our members get the fastest results. Tuesday - Westlake Office OPEN-normal hours. Elyria Office OPEN-normal hours. Wednesday - Westlake Office - Morning Hours Only. Office closes at noon for Thanksgiving holiday. During November, we are collecting canned foods to give to a local food bank. Please view our flyer below that lists the items the food bank is accepting. Each person who donates will be given a leaf in recognition of their contribution that will be on display at the office. Product Special - 15% Off! 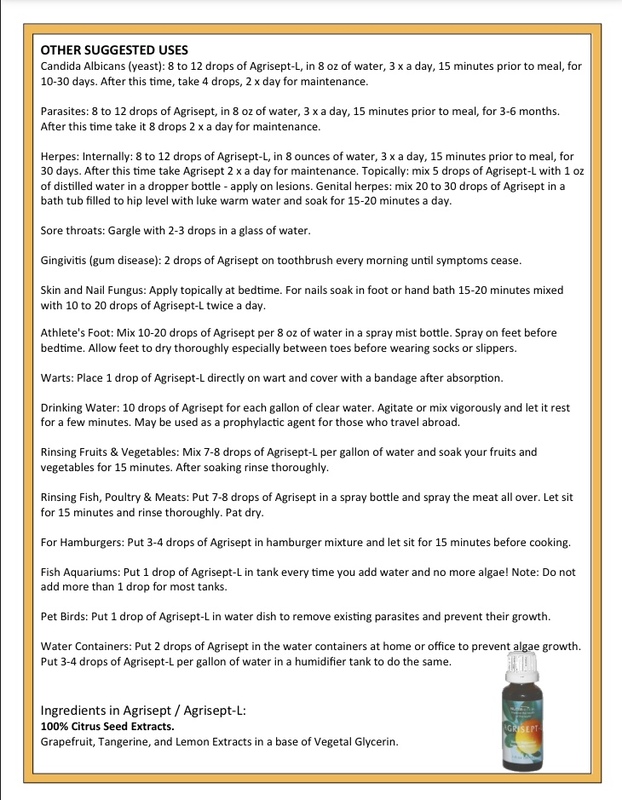 Agrisept is a product that helps boost your immune system and rids the digestive tract of unfriendly organisms, promoting overall well-being. Please view the diagram for more information. Enjoy 15% off your purchase of Agrisept this month, and grab a few for Christmas stocking stuffers! Breast Thermography returns November 10th, and we have been amazed at how this service has helped hundreds of our practice members, both male and female. To RSVP, call (440) 471-4200. It's important to have fun, it makes life more enjoyable, and this past week, we had plenty of fun opportunities to connect with new friends, including at AmTrust Financial and The Cleveland Clinic, and reconnecting with colleagues on behalf of our alma-mater, Life University at the OSCA Convention. If you would like to have us speak on behalf of your organization, either for a "Lunch & Learn" or exhibit at a health fair, please email drcasen@druglessdrs.com. We can't wait to help! This past week allowed us the opportunity to connect and share about health with some great people across a wide range of sectors including manufacturing, education, yoga, financial planning, and even having fun with some superheroes. There's still time to register for our November 10th Breast Thermography Day, and if you or someone you know is in the Naples, Florida region, have them head over to Kunjani Coffee this Saturday at 11:30a for a Women's Health Celebration with Dr. Bob. Go here for more. If you would like us to come and speak on behalf of your organization (Lunch & Learn, Health Fair, etc. ), please email drcasen@druglessdrs.com. We look forward to helping your team become as healthy as they can be! We are having a great time this month connecting with old and new friends. This past week we held a talk on the importance of going GMO-free for your health. You can watch more in this video from Dr. Bob. 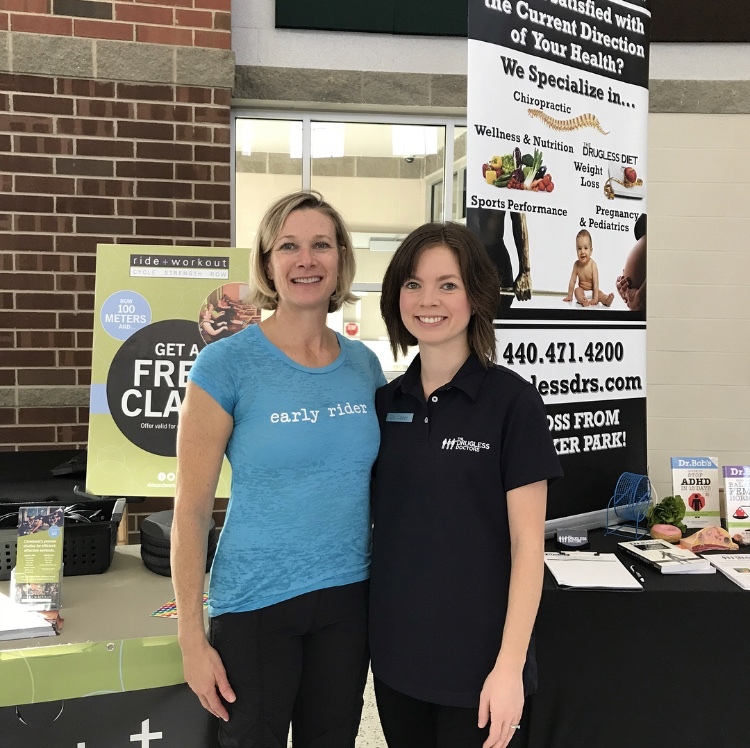 We also stopped by school and talked with teachers at the Olmsted Falls Health Fair - we love teachers and believe that a healthy teacher makes for healthy students! Lastly, Dr. Casen struck a pose with 3 Sisters Yoga talking about breast health. There’s still plenty of time to join us the rest of the month - go here to visit our October schedule, and go here to schedule your breast thermography appointment that will be held on November 10th at our Westlake practice. 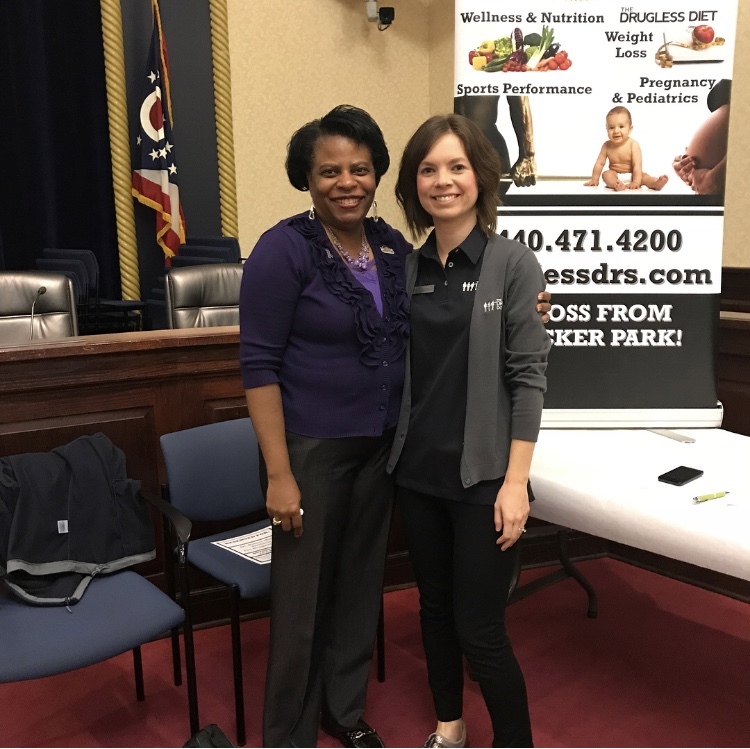 Lastly, we are always looking to spread the word about healthy living, and if you are a business owner, or someone who wants us to speak at your organization’s “Lunch & Learns,” please email Dr. Casen at drcasen@druglessdrs.com. We always try to bring the most relevant and timely health information to our practice members and digital community, and we kept on receiving requests to do a #H2H on blood sugar results. Please watch this month's recap below (Turn Up Volume). Underneath the video, you will find the audio recording (perfect for driving in the car) and Dr. A and Dr. C's notes. Please join us in October for our #H2H on Women's Health. 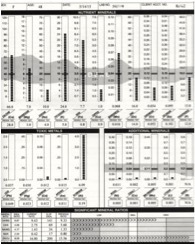 Nutrition 101 - What your blood tells you! 1. Why are a group of chiropractors talking about nutrition? Works hand & hand with chiropractic! 3. Stats: USDA -Using USDA data, found that broccoli, for example, had 130 mg of calcium in 1950. Today, that number is only 48 mg.
4. Well rounded lifestyle is the best nutrition – focusing on vegetables, proteins, and good fats. 5. Why would someone use supplements and what are the best kinds? 6. Wellness Nutrition vs Therapeutic Nutrition – Wellness is something that all people should do and therapeutic nutrition is based on some type of analysis or specific testing. A. Multiple Vitamin: (Bio-Multi Plus, Bio-Anabolic Pack, GlucoBalance, Bio–Glycozyme Forte) – multiple vitamins cover a wide range of possible issues. B. Vitamin D: (Bio-D Mulsion Forte) Vitamin D is important for immune and bone health. Most Americans are deficient. C. Essential Fatty Acids: Omega-3 – Good for the Brain – We recommend 3 capsules daily or one tbsp of oil per day. We rotate between Bio-Omega 3, Flax Oil, and Optimal EFA. D. Probiotic: BioDoph 7 – cultures digestion with billions of good bacteria. E. Immune Health: Agrisept and Bio-Immunozyme Forte. What is a simple way to evaluate therapeutic nutrition? Blood work – It’s the recipe for what is going on in our bodies! 2. Comprehensive Metabolic Panel – evaluates many minerals, enzymes, sugars needed for common body functions such as digestion, acid base balance, and liver function. 3. Lipid Panel – evaluates fats and cholesterols in the body- brain and body need oils- the building blocks. 4. Thyroid Panel – Helps to assess metabolism in the body, body signals- temp, wt. loss, hormonal function, energy. 5. Urinalysis – Evaluates how our kidneys are procession the metabolites from digestion. Other types of tests: HA1C, VIT D, TPO, Nutritional Microscopy, ACG, Bio-Communication, Test kits, EFA Bloodspot Test, Female Hormone Panels, saliva tests. We are entering the last third of 2017 (crazy!) and it's one of our favorite times of the year! Even though it's the beginning of the final stretch of the year - it's the perfect time to regain any goals you've had and to finish strong. If any of these goals are health related, we have plenty of events this month to help you do so! Sept. 6- "Half-Hour to Health" 12pm @ Westlake Office. TOPIC: Nutrition 101: Learn the basics of what your blood test means. Sept. 7- "Half-Hour to Health" 6pm @ Westlake Office. TOPIC: Nutrition 101: Learn the basics of what your blood test means. Make sure to take note of our office hours for Labor Day week. September Service Special ($115 – a $30 dollar savings)! Opti- Chem blood work and urinalysis. This is a comprehensive analysis of blood and urine includes a CBC with a differential, Comprehensive metabolic panel, Lipid panel, Thyroid panel, and urinalysis. This will allow the doctors to assess what’s going on in your body and create the right nutritional protocol for you. (Special is for active practice members only). Product Special (10% off) – The month of September the doctors are highlighting wellness products that every person could take. Our "Half-Hour to Health" in October will be on Women’s health. This is an excellent opportunity to learn about natural ways to help keep a female's body at its peak performance, October 4th at Noon in our Westlake office and October 5th at 6 PM in our Westlake office. Please bring someone who has never been exposed to chiropractic and natural health care so they can learn how to properly take care of their body. 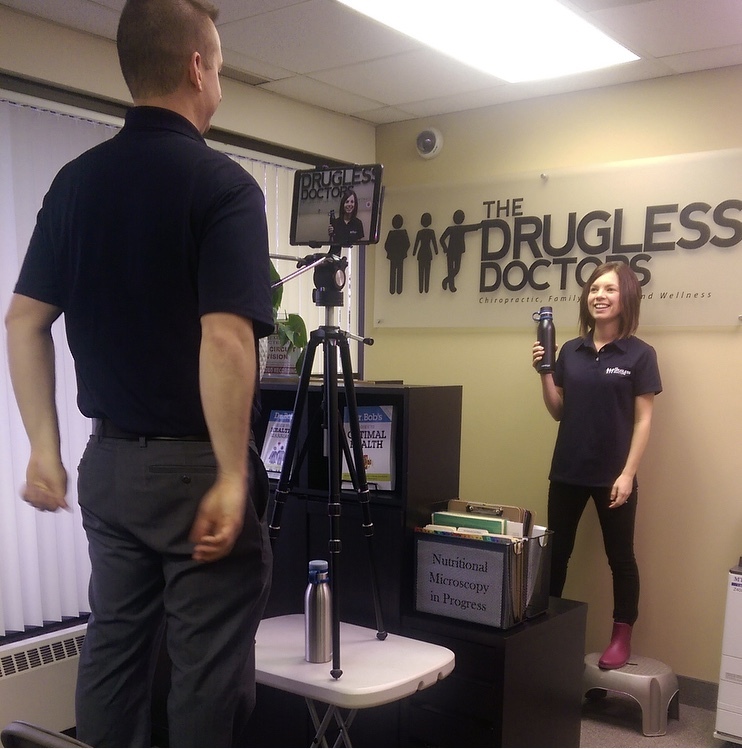 The Drugless Doctors | In Our Community - ReBol & More! One of favorite summer activities is to hang out with friends on a patio or rooftop, and we were able to do just that this past week at ReBol discussing healthy ways to detox. You can watch Dr. Bob's recommended detoxification here! We also visited O'Neill Healthcare for an engaging conversation on how stress affects our daily health and how we can give ourselves a drugless boost. This Wednesday (noon) and Thursday (6p), please join us for our "Half-Hour to Health" on SUGAR. We know you'll learn a lot. Have a great week! If you would be interested in having any of The Drugless Doctors team speak at an organizational event, please go here. We would love to help! After a relaxing July 4th holiday, we were back to meeting people at various organizations this past week. Coming up, we have a talk at ReBol next week that we hope you can join us. Go here for more information and to RSVP! This past week we met with Bay Village mayor, Paul Koomar, and we enjoyed sharing our passion for helping others. We also experienced cryotherapy at Cryoactive Fitness. One word: FREEZING!, but worth trying. Lastly, we met plenty of new individuals at The Westside Flea. We look forward to meeting many of you in the community throughout the summer and into the fall!